The following is an excerpt from The Gospel Under the Northern Lights, a book I’m working on about my experiences as a missionary in Fort Babine, British Columbia. This is from chapter 4. The events described took place in 2002. Now what I’m about to tell may be hard to believe. When I’ve told this story to people from Smithers and elsewhere, I usually get looks of “Yeah, sure!” But I assure you that this really happened and in exactly the way I’ll tell it. I have witnesses. I was bringing the stuff for Emma up to Violet’s place. As I was going up the hill, Lyle and a bunch of other kids jumped in the truck. I gave them a ride up there. 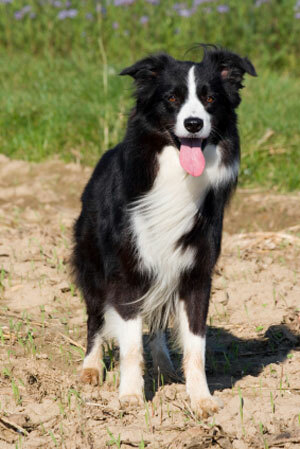 At the top of the hill, at Violet’s house, there was a nasty black and white border collie. Skipper was his name. He was always there and he was always unhappy to see me. On that day, Skipper attacked my truck. He bit a massive hole in the sidewall of the driver’s side front tire. As I got out of the truck, I could hear the air hissing out. I could hardly believe that a dog could do such a thing. But it happened. As Dave Barry would say, I am not making this up. Before losing all the air, I moved the truck to a flat place for the inevitable tire change. I brought the stuff for Emma in the house and then got to work on the truck. I winched the spare tire from underneath and found another flat. Two flat tires in the middle of nowhere! Fred William gave me a ride back across and we were able to arrange the transport of two tires via a couple of elders from the Smithers church who were coming to visit us the next day. That was the day we started keeping TWO spare tires with us in Fort Babine at all times. Not long afterwards I was at Violet’s place again. This time for a visit. I had been watching some videos by R. C. Sproul with my catechism class and Violet mentioned to Rose that she wanted to watch them too. So we watched the first video together – Violet’s mom Emma was there as well, so was Mary Michell. Afterwards, we talked. We got on to the topic of church membership. I suggested that she could become a member of Wit’at Reformed Fellowship and outlined what that would entail. She thought it was a good idea and agreed to start taking instruction from me to that end. So, soon after this, I began regularly instructing her in the basics of the Christian faith. That meant that I was going up to Violet’s place more often. And encountering Skipper. He finally got what was coming to him. I knew that he was always waiting there to make my life miserable. I had a couple of cans of bear spray lying around the house. If you don’t know, bear spray is a high octane cayenne pepper product used to ward off bear attacks. Apparently it also works well at teaching border collies some respect. Never had a problem with Skipper after that. But a word of advice to all you kids reading this (and adults too): always wash your hands after using pepper spray and definitely before going to the washroom, especially if you’re a guy. Trust me on that one.